This article actually came out a few weeks ago, but it's a really nice spread on the three Fulbrighters and our projects here in Singapore. The newspaper is called The New Paper, and has the second biggest readership on the island behind the Straits Times. 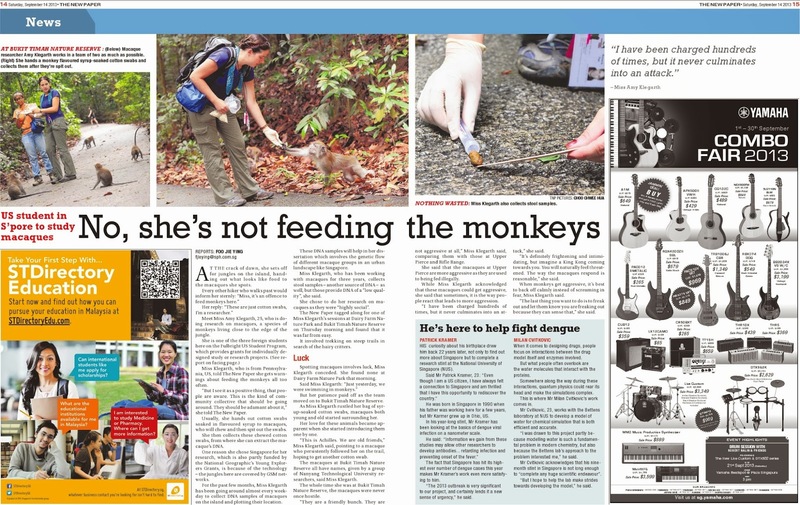 The big spread features Amy and her monkey expeditions throughout the country. 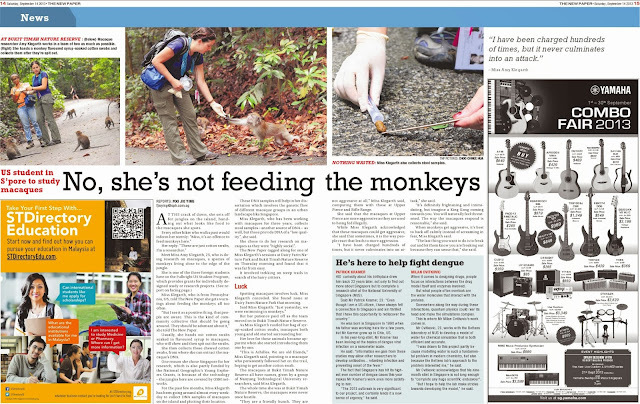 The image above isn't the highest resolution, but you might be able to zoom in if you'd like to take a gander at the juicy details of chasing monkeys throughout Singapore's parks. Links to shortened version of her story can be found here (full story) or here (better picture of Amy). HIS curiosity about his birthplace drew him back 22 years later, not only to find out more about Singapore but to complete a research stint at the National University of Singapore (NUS). Said Mr Patrick Kramer, 23: "Even though I am a US citizen, I have always felt a connection to Singapore and am thrilled that I have this opportunity to rediscover the country." He was born in Singapore in 1990 when his father was working here for a few years, but Mr Karmer (sic) grew up in Ohio, US. In his year-long stint, Mr. Kramer has been looking at the basics of dengue viral infection on a nanometer scale. He said: "Information we gain from these studies may allow other researchers to develop antibodies... retarding infection and preventing onset of the fever." The fact that Singapore has hit its highest ever number of dengue cases this year makes Mr Kramer's work even more satisfying to him. "The 2013 outbreak is very significant to our project, and certainly lends it a new sense of urgency," he said. The sting from the disappointment of never making the "Question of the Day" at Notre Dame's daily, The Observer, isn't as bad now. I also failed to make any of the fashion features, despite my Classy Mondays the past four years.